She learns as she goes with making cards from some paper, stamps, and the occasional marker or watercolor. This kit is sold out (Sorry! ), but the individual pieces should be available; I have linked to the items that I have used in the kit. Roses - RV21, RV23, RV25; Smaller Flowers - B60, B63; "Daisy" - BG000; Oval flowers - BV0000, BV000; Larger leaves - G20, G94, G99; Smaller leaves - G20, G24. 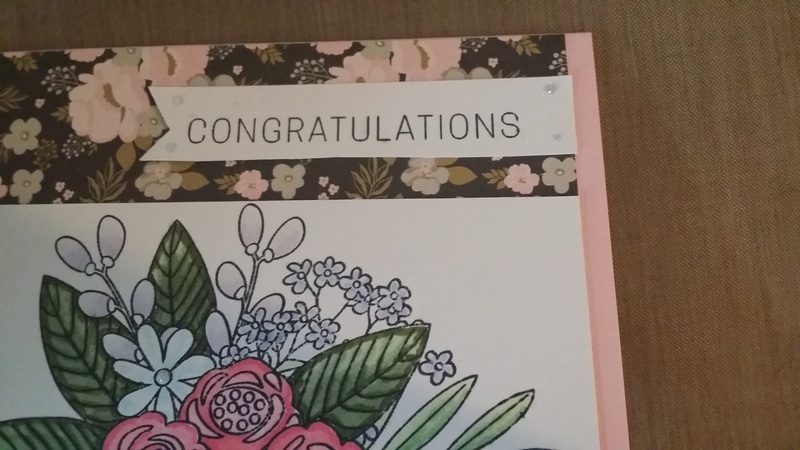 I also used some Nuvo Glitter Drops in White Blizzard for a finishing touch. Go figure that I enter the very last time Mojo Monday occurs! So, seeing some of the designs that came in did help, but I wanted something a bit different. 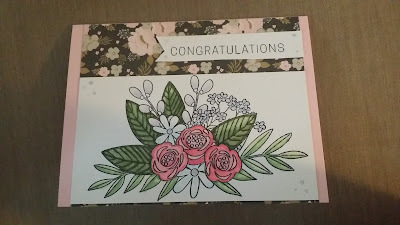 I love Verve Stamps and I wanted to convey a "happy trails" kind of theme without being too sappy (I am a bit of a sap, but don't ruin my rep!). The paper came from Illustrated Fairh, the ribbon came from Hobby Lobby, and the sentiment is from Verve's New Mercies set. 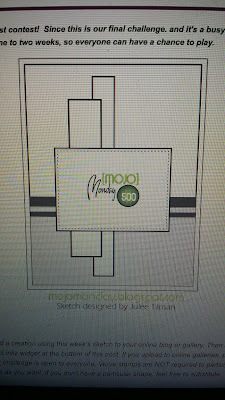 I also figured out the two-finger bow method that Gina K. uses on her cards. Yay! Today's Adventure in Watercoloring: Flowers! Hi, everyone! This lesson (the final one!!!) shows us an easy way to free-paint flowers and leaves. Admittedly, I was a bit nervous since I don't normally free-paint and I was concerned my leaves would just end up looking like blobs on paper. Thankfully, it didn't turn out that way! 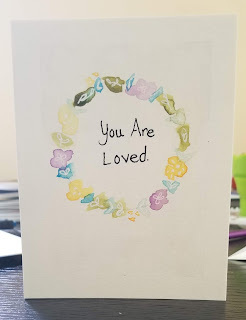 Card one features a wreath design; it was supposed to be a more abstract wreath and my coloring proves just how abstract it is! (You can laugh; I sure did.) I can see where I need to improve upon but it did turn out well for the first try! Card two is supposed to be layers of leaves; I was not happy with how it turned out because I was having trouble forming the leaves in the first place (IOW, it's totally the student's fault!). Thankfully, I was improving as time went on. Hi, everyone! Marie here with something really neat. 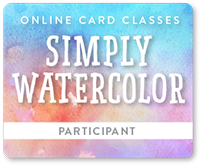 I figured I needed to seriously up my watercoloring game, so I signed up for the Simply Watercolor class at Online Card Classes that is hosted by Kristina Werner; I'm glad I did because she is really good at watercolor! Anywho, today is Day 1 of the class and I have three examples of what I'm doing! 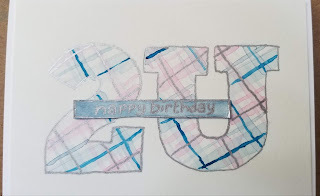 Card 1: A really nifty technique that had me try plaid (and my shaky attempt doesn't look too bad); I will definitely keep trying in the near future, because I love the look of plaid! Card 3: Another geometric design, but using circles as an example. I can definitely see this used for bubbles on other cards or possibly glass orbs, if the wash and shading is right. After finishing this first class, I can honestly say it was $20 well-spent. I've already learned a lot (and I really need to learn control on the brush) and I am pleased with my results. 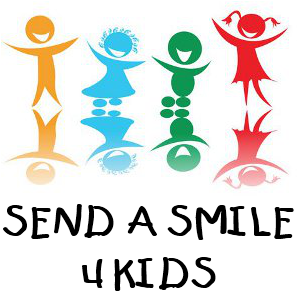 I do not have affiliate links; any links I use go directly to the site of purchase.